We’re back, with another Big Finish Doctor Who audio drama review! 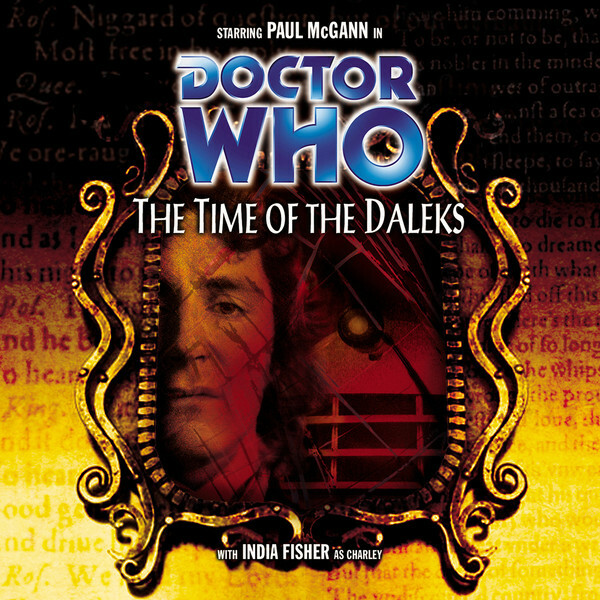 This week, we’re listening to The Time of the Daleks, by Justin Richards, starring Paul McGann as the Eighth Doctor and India Fisher as Charley Pollard. This story is the 32nd entry in the Main Range of audio dramas. Let’s get started! Inside a time fissure, a group of Daleks have deployed a Temporal Extinction Device. However, its detonation renders the fissure unstable, overpowering their time ship. Just before destruction, they open a time corridor with one end on the fissure and the other on the planet Earth. They send out three strategists, plus their pilot, to find a solution. One strategist is crushed by the corridor as it collapses; the other three Daleks escape, leaving their fellows behind to await rescue. Elsewhere, the Doctor and Charley Pollard feel the effect of the Dalek action, as the TARDIS is forced to ride out the temporal energy wave. In the course of the incident, the Doctor makes a Shakespearean reference, but is stunned to realize that Charley does not know the famed poet. When he remembers that Orson Welles also did not remember Shakespeare during their recent encounter, he realizes the problem is larger than he thought—and he detects the time fissure, reaching from the 21st century backward through time to 1572. It seems Shakespeare is disappearing into the fissure—not definite as yet, but definitely possible. The Doctor sets out to save the playwright, and all of time with him. In the 21st century, Britain has survived the Eurowars and become a benevolent dictatorship under the leadership of General Mariah Learman. Learman is steadfastly refusing to allow general elections and restore the democracy, to the consternation of her niece Viola and her young kitchen boy; Viola wants her to step down and allow elections. Meanwhile, Learman’s subordinate, Major Ferdinand, supports her in this show of strength. As she concludes a public address (with a Shakespeare quote, no less), rebels Priestly and Hart listen in, and vow to fight to restore democracy…and William Shakespeare, as well. The TARDIS lands in Learman’s home, Britain’s new capitol. The Doctor and Charley immediately encounter Ferdinand, who takes the Doctor to be an expected public relations expert summoned by Learman; he plays along, after ensuring the real expert will be denied entry. Learman reveals that people have begun to forget about Shakespeare, and that they blame her for it, adding fuel to the relatively small rebel movement. She introduces the Doctor to Viola, sending the kitchen boy back to the kitchen. Viola acknowledges Shakespeare’s improbable removal from history, though Learman attributes it to mass hysteria. The Doctor suggests that the removal of Shakespeare from history hasn’t happened yet, but is becoming more probable, accounting for the increasing loss of his memory in the public. Learman is not surprised; and to the Doctor’s own surprise, she admits that the rebels blame her because she has been experimenting with time travel. The rebels themselves are falling victim—one of their number has forgotten Shakespeare. Hart suspects that Learman’s experiments are intended to save Shakespeare, but Priestly scoffs at the idea. Viola contacts the rebels and urges them to wait before acting, as she hopes to persuade Learman to step down. She tells them about the Doctor, and they agree to hold off attacking Learman. Meanwhile, Learman takes the Doctor and Charley to her would-be time machine—a hall lined with mirrors and filled with hundreds of clocks. A Professor Osric is there, working on the machine’s master clock. The mirrors are coated with orthopositronium, which uses the Heisenberg uncertainty principle to alter time itself; using a parallel universe in which light moves at a different speed, it can connect its mirrors to a mirror at any point in the past. However, it is not working; it requires a steady source of chronons for power. Osric claims it has worked once; a month prior, the mirrors opened, admitting someone who has helped him. The Doctor suspects he knows what is coming. Osric’s “help” enters the room: the Daleks. These Daleks are different, however. They make no attempt to exterminate; and they claim to revere Shakespeare, which the Doctor does not believe. However, their help has started the recharging of the master clock; within an hour it will be fully powered. Learman, also a Shakespeare enthusiast, intends to see the first performance of Julius Caesar live; she brushes off the Doctor’s warnings about the Daleks. The Doctor returns to the library, leaving Charley in the hall of mirrors. He meets Viola en route, and she tries to enlist him in her attempts to persuade Learman to concentrate on the country rather than Shakespeare. She explains that everyone is having nightmares of a future full of oppression and conformity; and she suspects it will become real. The Doctor understands; the Daleks will bring in such a future. In the library, the kitchen boy is reading, and the Doctor falls into a trance because of the temporal anomalies. When he revives, he and the boy look at the historic First Folio of Shakespeare’s works, which had been on display, and find it blank. They may be out of time already. Meanwhile, Ferdinand, Learman, Charley, and Osric await the activation of the machine in the hall of mirrors. When the clock is fully powered, Osric uses it to bring up an image of the Globe Theatre in the mirrors. The Doctor arrives and tries to stop the machine, but is himself stopped by Ferdinand. The Daleks use the machine to open a time portal via the mirrors, connecting the hall to their time ship in the vortex. Daleks flood through the portal and into the room. Learman welcomes the Daleks, who set about guarding Learman’s work. They insist on rescuing Shakespeare, but the Doctor remains unconvinced, even though Learman knows about their stranded ship. He agrees to help for the moment. Meanwhile, the Daleks exterminate all extraneous humans in the palace, and their compatriots on the ship are preparing another Temporal Extinction Device, which will be powered by the palace’s nuclear reactor. A source of chronons in the hall of mirrors, assumed to be the master clock, will stabilise the device, allowing them to conquer all Time. In the library, the Doctor, Charley, and Viola examine the now-blank folio; Viola is distressed to find that the kitchen boy had been reading it earlier. She bluffs her way past the Dalek guarding the library and goes out. To delay things, the Doctor begins converting the now-useless master clock into an actual temporal stabiliser, but lengthens the work. As he returns to the hall of mirrors, he again quotes Shakespeare…but the quote, strangely, is recognized by the Dalek in the hallway. Viola gets in touch with Priestly, but is tracked and captured by the Daleks. Priestly, hearing her capture, tells Hart to attack, and the rebels storm the palace. As the Daleks retaliate, Viola escapes in the confusion, but refuses to go with the rebels, as her presence will attract the Daleks. She sends Priestly and Hart away, but they are captured by Ferdinand. However, he knows the Daleks are a bigger threat, and joins forces with them; he lets them escape while he holds off the Daleks. Meanwhile Viola breaks into the hall of mirrors and takes the master clock while the Doctor and Charley watch; she threatens to destroy it if the Daleks don’t back off. The kitchen boy arrives and interrupts the scene; to prevent the Daleks from killing him, Viola resets the master clock, causing a new time period to appear in the mirrors. Viola escapes through a mirror, accidentally taking Charley with her. They find themselves in 19 September 1572, still on the palace grounds; they must make their way to another mirror, hidden a half mile away in the building where—in the 21st century—the rebels have been hiding. They see Daleks herding slaves along the road and killing the weak. Charley realises what the Doctor meant earlier: the Daleks have used the time fissure to change history, trying to bring about a timeline in which they have always enslaved Earth. It is this timeline of which people have been dreaming. She and Viola are spotted by the Daleks, who chase them toward the mirror. The Doctor is forced to concede that the master clock works; however, without it, the Daleks can’t open time portals. The Doctor can build a short-term stabiliser, and so the Daleks lock him in Ferdinand’s office, with Ferdinand, to work. There is a mirror in the office; and with the jury-rigged stabiliser, they step through. They find themselves in the rebel camp, where the rebels’ mirror is set to 1572. Although it has not worked since a month ago, it is opening now, showing Viola and Charley as they try to open a portal. The Doctor hears Charley warn Viola about Daleks, indicating that history is already changing. He opens a portal to the hall of mirrors, where he finds Osric and the kitchen boy. Osric admits to helping Viola give the rebels a mirror, but can’t explain why. The Doctor sends him to the rebel camp to rescue Charley and Viola. Afterward, he wants the rebels to hit the Daleks before they can make permanent changes to history. Immediately after Osric leaves, the Supreme Dalek arrives with Learman, and realizes they have been betrayed. Unfortunately, Osric needs a chronon source to open a portal, and the Daleks are approaching. Charley meets with Viola, and the portal suddenly opens, allowing them through just before the Daleks open fire. This changes the probabilities of history again, and the Daleks in the Elizabethan period vanish, replaced by human soldiers. Priestly and Hart decide to use their mirror to enter the hall of mirrors and surprise the Daleks—but when Osric goes through, he finds that the Daleks are onto him. They exterminate him and summon reinforcements to handle the invading rebels. The Doctor tells the kitchen boy to stay hidden, and then steps out to confront the Supreme Dalek. He tries to persuade the Daleks to capture the rebels rather than kill them. However, the rebels open fire anyway—and in the crossfire, Charley is shot by a Dalek. The master clock takes the brunt of the blast, leaving Charley stunned but alive. The rebel survivors retreat into the palace, having taken many losses—and Priestly learns that Hart no longer remembers Shakespeare. Instead, Hart remembers the Daleks ruling Earth since the dawn of time, with Learman as a current puppet ruler. Priestly decides the only way to stop the Daleks is with the nuclear reactor. Meanwhile, Learman dismisses Charley as unimportant and checks on the damaged master clock; it will not open any portals. The Daleks imprison Charley as leverage on the Doctor, and set Viola and the kitchen boy to care for her. The Supreme Dalek orders the Doctor to repair the clock, and then returns to its ship—but the Doctor still doesn’t know how it worked in the first place. He bluffs for permission for himself and Ferdinand to speak to Charley, while on the ship, the Supreme Dalek reports to the Emperor. The Doctor manages to get some privacy with Charley, Ferdinand, and Viola, and plan to escape the room—but the Daleks have smashed all the mirrors inside. The Doctor sends the kitchen boy to get lunch, with some very specific instructions. When he returns, the Doctor uses the silver foil on the food to create a makeshift mirror, and then assembles another device to open it. The Daleks detect the new portal, however; and though Viola and Ferdinand escape, the Doctor, Charley, and the boy are taken captive. Charley and the Doctor are taken to the Dalek ship. The rebels find the reactor swarming with Daleks, who want to use it to power their ship. Priestly decides to blow up the reactor; Hart, having new memories of years of combat with the Daleks, is able to help. They are met by Viola and Ferdinand, who raided the armory on their way over; they reveal that the Daleks have taken Learman to their ship for reasons unknown. Ferdinand stages a decoy attack, followed by an attack on the reactor from the rear, using plastique to gain entrance. The Supreme Dalek gives the Doctor an ultimatum: fix the master clock within an hour, or see everyone left in the palace exterminated. They leave to return to the hall of mirrors; but when Learman visits the Supreme Dalek, the Doctor and Charley stay to eavesdrop, losing their guard in the process. Learman, it seems, believes that Shakespeare is too transcendent for the masses to understand, and therefore she wants the Daleks to kill Shakespeare rather than save him. She intends for them to provide her with a temporally shielded copy of his complete works, making her the only person in the universe to know he existed. The Doctor then accesses the ship’s flight data recorder, and learns how the Daleks got here—the time fissure was already present before the Daleks arrived, and they have an entire fleet in the vortex. He learns of the damage to the ship, and the escape corridor which allowed a few Daleks to escape; the survivors made the deal with Learman and used her machine to access and stabilize their ship. However, the pilot is unaccounted for—and what was the device the Daleks were using in the time fissure? The attack on the reactor commences. Hart and most of the rebels are killed, but Ferdinand, Viola, and Priestly make it to safety behind the radiation shielding. They begin sabotaging the reactor, knowing this has become a suicide mission. The Doctor and Charley return to the hall of mirrors, but are detected. The Daleks also detect a chronon source in the hall, which seems to indicate that the Doctor has repaired the master clock. Learman and the Supreme Dalek arrive, and set the clock to show several different time periods, all of which are being overrun by Daleks, making their victory more and more certain. Learman consents to it, saying that humanity is too decadent to win; with her plan, at least the memory of Shakespeare will not be lost. The Doctor plans to stop her, but suddenly an alarm announce that the reactor will explode. If it happens while the mirrors are open, the explosion will be transmitted through the portals and destroy London in every time period—and it will also reach the Dalek ship, causing a chain reaction throughout their fleet of 1700 ships. This could irreparably damage the web of time itself. The Supreme Dalek refuses to accept it, believing his forces will stop the rebels; and he sends a squad to assassinate Shakespeare. The Doctor realizes the nuclear explosion is the event which created the time fissure in the first place, allowing the Daleks to invade; and Time is about to be conquered. Several Daleks self-destruct to break into the reactor, but in the process they damage its core seals. More Daleks manage to enter the reactor and shut it down, and Priestly is killed. Ferdinand and Viola escape, and the blast shutters close behind them—the crisis is averted, but the Daleks inside will be trapped forever in the irradiated area. When Learman leaves the hall of mirrors, Charley gives the Doctor an idea. He resets the master clock in Charley’s hands; had she not been holding it, she would have gone back in time a few seconds, met herself, and been destroyed by the resultant energy discharge, but as it is, the portals’ endpoints have simply been changed. The Daleks who were headed to Shakespeare’s era arrive in other places: one is destroyed in the Blitz, while the other is destroyed by the Romans at a fort near London. The Supreme Dalek is not dismayed; he tells the Doctor that the Daleks are using Time Lord technology gained from their aborted invasion of Gallifrey and their study of the time barrier at Kar-Charrat. The Doctor learns the Emperor is aboard one of the ships in the fleet, indicating the Daleks are confident of victory; they must have some other means of opening the fissure. The Supreme Dalek reports to the Emperor; the Temporal Extinction Device is ready, and the master clock is functional, and they only lack a pilot, as theirs was destroyed in the palace. The Doctor deduces that the Daleks tried and failed to detonate a weapon in the fissure, which is what trapped them there. He uses the mirrors to view the past—specifically, the arrival of the pilot and two surviving strategists in the palace, and sees Learman quote Shakespeare, only to have the Daleks respond in kind—thus laying the groundwork for their agreement. When Learman touches the pilot, it disintegrates in a burst of temporal energy. In the present, the Daleks take Learman captive and announce that they will transform her into their new pilot, as she has the necessary knowledge. They force through a temporary time corridor and into the reactor; this setup, coupled with certain drugs, will cause her to mutate at an accelerated rate, becoming a Dalek mutant. The Supreme Dalek kills a Dalek who has failed him, and places the newly-mutated Learman in its casing. As an ironic fulfillment of their agreement, they attach a memory sphere containing Shakespeare’s complete works. With Charley’s help, the Doctor realizes the truth of the situation, and returns to the library. The kitchen boy is there; and the Doctor has guessed the truth about him: he is the playwright himself, William Shakespeare, kidnapped at the age of eight by Viola. The master clock has never worked; it was residual energy from the first temporal extinction device, bleeding through the fissure, which powered the mirrors a month ago. At that time, Viola slipped through the rebels’ mirror and rescued “Will” to prevent Learman from reaching him—but this inadvertently caused the changes in history they are all trying to prevent, creating a paradox, which is what caused the time fissure in the first place. The Daleks, preparing for their triumph, summon the Doctor, Charley, Viola, Ferdinand, and Will to the hall of mirrors. The new pilot departs for the ship, quoting Shakespeare as it goes; the Doctor realizes it must be Learman. To ensure that the Doctor does not interfere, the Supreme Dalek takes Charley hostage, and reveals that the TARDIS is now aboard the ship. Charley is taken to the ship as well. The Daleks place the master clock on the ship, and chronon levels begin to rise; they sever the link with the palace. Determined to rescue Charley, the Doctor and Ferdinand distract one of the two Daleks on guard; when it fires on them, the mirrors deflect the blast to destroy the second guard, as the Doctor intended. Ferdinand tackles the other Dalek with his last grenade; but he can’t get it attached, and so sacrifices himself to blow up the Dalek. The Doctor opens a portal to the ship, and he, Viola, and Will enter; he tells Viola that the master clock doesn’t work, and another source of chronons is present on the ship, just as it was the first time the portals opened. The Supreme Dalek sends Charley for extermination, but the Doctor rescues her, sending her guard tumbling to destruction in the vortex. The Doctor, Charley, Will, and Viola retreat to the TARDIS and leave. He tunes the scanner to the Daleks’ monitors to see the endgame. The master clock will not work as a stabiliser, because the real source of chronons is—both now and before—Charley. The Daleks deploy the Temporal Extinction Device in the fissure, but as before, the fissure becomes unstable, and a wave of temporal energy strikes the ship. The Daleks open a corridor and send out three strategists and a pilot; one strategist is destroyed. It seems time is repeating itself, and the Daleks are caught in an infinite loop. This is why the pilot detonated when Learman touched it—it was Learman, and the touch shorted out the time differential. Outside the loop, history will continue unimpeded—and everyone’s memories of Shakespeare are restored. The Doctor takes Viola back to her own time and Will to his. However, all is not as it should be; the constant string of paradoxes has revealed the truth to the Doctor. The web of time itself is unraveling, and Charley Pollard is the cause. It remains to be determined if it can be saved, and how. I can remember, as a child, reading books related to my favorite television shows and movies–Star Trek, Star Wars,, and yes, even Doctor Who, for example—and thinking how odd it was that they didn’t always seem to connect to their parent shows. Sometimes the discrepancies were egregious, and sometimes they were subtle, but in every case it was clear that a different production team was producing these related and spinoff materials, without much regard for what the original team had in mind. What I was hoping for, even back then, was something along the lines of the Marvel Cinematic Universe, where different plotlines—and even different media—would be coordinated to interconnect. I still think it’s a great idea, although it’s the flavor of the week right now, to the point that we could easily get sick of it. Big Finish, in my opinion, is its own cinematic universe, especially where the Eighth Doctor is concerned. It’s more than just the resurrection or resumption of old plot lines within a range—like the Headhunter returning in multiple seasons of the Eighth Doctor Adventures—which is something that happens all the time. Big Finish makes an effort to connect various ranges, having not only characters, but whole plotlines cross over. That’s what’s happening here, in this story, which fills a niche not only in the main range, but also in the Dalek Empire series. This is the fourth and final Dalek Empire entry in the main range, leading into the four (currently anyway) Dalek Empire miniseries. (For reference, the first three were The Genocide Machine, The Apocalypse Element, and The Mutant Phase. The first two are referenced within this story; the third is not, but it chiefly served to establish the basic facts of the Dalek Empire rather than to portray a relevant event.) At the same time, this story is also a key part of the anti-time story arc which centers on Charley Pollard, and which will come to a head in the next story. The two arcs are integrated as well as possible, but it leaves this story very busy, very hectic; I had difficulty keeping up this time. It’s a good entry, but very rushed, despite being a little longer than most main range entries. The story centers around William Shakespeare, but his appearance here is unconventional. While the Doctor has met the bard at least half a dozen times before (including one incident in which Shakespeare traveled in the TARDIS), this is certainly Shakespeare’s first encounter with him; however, it is not such that Shakespeare would necessarily remember him or be able to recognize him. (To say more would be a spoiler.) They will meet again at least twice more in the Doctor’s lifetime. The resolution of this story is quite clever; but at the same time, it depends on a paradox, which in my opinion is always a bit unsatisfying. I don’t care for the idea of a time loop that has no beginning—the original input, as it were, should come from somewhere. Nevertheless, that is what we have here, and the story does not shy away from the idea. It recycles the Blinovitch Limitation Effect (first seen in Mawdryn Undead), though it changes it up a bit; the discharge of power here is enough to destroy a Dalek (while curiously leaving a soft, fleshy human unharmed). Continuity references: I’ve already mentioned The Apocalypse Element and The Genocide Machine. The Dalek mutation process mentioned here dates back to Genesis of the Daleks, and was first used against humans in Revelation of the Daleks. The Eurozone and Eurowars are mentioned (Trading Futures; Learman is also mentioned in that book). Orson Welles is mentioned as not recognizing Shakespeare in Invaders from Mars. The Roman fort from Seasons of Fear appears again. Shakespeare’s other meetings with the Doctor occur in The Empire of Glass (First Doctor and Fourth Doctor), Planet of Evil (Fourth Doctor), City of Death (Fourth Doctor), The Stranger, The Writer, His Wife and the Mixed Metaphor (Fourth Doctor), The Kingmaker (Fifth Doctor), A Groatsworth of Wit (Ninth Doctor), and The Shakespeare Code (Tenth Doctor). The Doctor’s line, “Lay on, MacDalek!” appeared in We Are The Daleks. In addition to Turn Left, using mirrors for travel appears in Warrior’s Gate, though relating to universes rather than time. Overall, it’s a good story, just a bit hard to keep up with. As a Dalek story, it feels a bit shoehorned into this pseudo-“series” arc. Hearing Daleks quote Shakespeare is…odd, at best, and bizarre at worst, but it’s always entertaining. It’s a decent setup for Dalek Empire, and a so-so setup for the next installment; but mainly I’m just glad to be past it for now. Looking forward to the end of the arc! Next time: On Thursday, we wrap up the second season of the Eighth Doctor Adventures with The Vengeance of Morbius; and on Monday, we finish up this round of Main Range Eighth Doctor stories with Neverland! See you there. With Christmas behind us, we’re back, with another Big Finish Doctor Who audio drama review! This week, we’re listening to Main Range #15, The Mutant Phase, starring the Fifth Doctor (Peter Davison) and Nyssa (Sarah Sutton). Let’s get started! At an unknown time in the future, a starship is conducting a survey when it is attacked by a swarm of over a hundred billion strange creatures, flying so tightly that they appear to be a single organism. The ship is knocked off course; its commander, Ganatus, and scientist Ptolem find that they are near–and possibly crashing on–the planet Skaro, home of the Daleks. Elsewhere–or rather, elsewhen–and aboard the TARDIS, Nyssa repairs the proximity alarm, only for it to go off. The Fifth Doctor tries to evade, but finds that they have been captured by a time corridor in the vortex. They escape by “bouncing off” the corridor; in the process, the Doctor notices a strange ripple in time, a “bump” in the timestream. They land in a cornfield in Kansas. Emerging from the TARDIS, Nyssa is stung by a large wasp, but defers getting any treatment. They are then interrupted by what seems to be a spaceship passing overhead; another soon follows. They find a body in a field, which has been shot; it bears marks of technological implants, which have since be removed. The Doctor determines that the year is 2157 (actually 2158, as it turns out, but who’s counting? ), and immediately insists that they leave. Meanwhile, Ptolem and Ganatus are also on Earth–but not in the same time period–and report that the Doctor has been located in 2158. Ptolem advises waiting, however; the Doctor won’t stay long, if history is correct. Returning to the TARDIS, the Doctor and Nyssa are intercepted by a strange man, one with implants like those that had been removed from the body. The man–or Roboman, rather–calls for backup. A spaceship arrives, and the Doctor recognizes it: It is a Dalek saucer. A Dalek emerges, showing signs of battle damage, but doesn’t recognize the Doctor. They break for the TARDIS and escape; the Doctor tells Nyssa, who didn’t recognize the Daleks, about his history with them–he knows them, but in this time period, they do not yet know him. He previously encountered them on Earth, a few years after 2157, during the end of the Dalek invasion of Earth. But now they have another problem: having dematerialized, they are caught in the time corridor again. They can’t escape via time; but they can alter their spacial coordinates, landing somewhere afield of wherever the corridor takes them–and it’s as well, because wherever they land, there will be Daleks there. No one else has the ability to create these time corridors. Ganatus reports to the Daleks that the Doctor has not arrived in the right place. The Daleks intend to find him. Upon landing, the Doctor and Nyssa find themselves underground. They are taken in by two humans, Dolores and Albert, who offhandedly mention the “Thals”, piquing the Doctor’s interest–after all, the Thals are the other race from Skaro, and ancient enemies of the Daleks and their predecessors, the Kaleds. Albert admits the Thals have helped the humans on Earth, of whom there are only a few left; but he doesn’t know much about them, and indeed, they appear to be mostly serving their own interests. However, thirty years prior to this time, there was a disaster on Earth, which led to the depopulation of the planet. Dolores takes the Doctor to see a scientist, Professor Hendryk, while Albert tends Nyssa’s arm. The Daleks have decided to return to Skaro. However, one of them loses control, and breaks open, revealing that it has further mutated and is now deadly to the other Daleks. The Daleks try to kill it, but Ptolem stops them, and takes it for study, placing it in containment. Albert slips away briefly, and Nyssa finds him reporting their presence to someone–the Daleks, she assumes. Her arm still untreated, she goes to find the Doctor. The Doctor, meanwhile, meets with Hendryk and compares notes. Hendryk does not know about the Daleks–revealing that their invasion was centuries ago–and shows him one of the mutated creatures, similar to the one being viewed by Ptolem and Ganatus in the future, but dead. He describes how a swarm of them came to Earth and drew all the life out of the planet, but then died suddenly and without any known cause. On Skaro, a crisis is happening. The numbers of mutated Daleks are increasing rapidly, and they are assaulting the Dalek defenses. Soon they will break through. A squad is dispatched through the time corridor to Earth to claim the Doctor, whose presence has been located.Ptolem and Ganatus are sent with the squad. Nyssa, meanwhile, finds Dolores, who doesn’t comprehend about Albert; but she takes her to the Doctor and Hendryk. They immediately head for the TARDIS. Albert finds them, and turns them over to the Daleks. Albert and Hendryk are killed by the Daleks; the Daleks also kill Dolores and threaten Nyssa, persuading the Doctor to surrender. The Doctor is taken before the Dalek Emperor, who insists on his help. After much debate, he concludes that, as bad as the Daleks are, the mutant creatures are worse; and he agrees to help. Meanwhile, Ptolem examines Nyssa’s arm, and finds a strange thing: Insect eggs in the wound, which share some DNA with the mutant creatures. He extracts them, and treats her wound, and takes the eggs for research. He reaches the same conclusion the Daleks have reached: the mutant phase originated in 2158 on Earth. It spread from the first affected Dalek, because the Daleks routinely undergo genetic extraction, which is used to breed the next generation of Daleks. The Daleks need the Doctor because they lack the power to go back far enough to change the events of 2158. It is the final moments for Skaro. The creatures are breaking into the Dalek city. The Doctor, Nyssa, Ptolem, and Ganatus flee in the TARDIS, back to 2158, as the Emperor destroys Skaro rather than let it fall to the creatures. Unexpectedly, Ganatus collapses. In flight, the Doctor tries to sleep, and Nyssa does some research. However, Ptolem has a secret–and unknown to him, Ganatus does too…Nyssa determines from records what killed the mutants on Earth, but before she can discuss it with the Doctor, Ganatus awakens, and the cloister bell sounds. The time corridor is collapsing around them…the Doctor breaks them free of the corridor, and lands, and finds that they are in the exact spot where the TARDIS landed the first time, in Kansas, 2158. They watch on the monitor as their earlier selves are accosted by first the Roboman, then the damaged Dalek. The earlier version of the TARDIS had dispersed itself via the Hostile Action Displacement System; realizing their earlier selves are about to walk in on them, the Doctor dematerializes, allowing the earlier TARDIS to return, preserving events. Nyssa explains that a pesticide, GK-50, killed off the creatures in the future. The wasp that stung her had been made aggressive by exposure to genetically modified crops; the same wasps also penetrated the damaged Dalek’s casing, making it patient zero for the mutated DNA. It must be stopped. They go after it; but first, they synthesize some GK-50, although Ptolem doubts it will work this early in the mutation’s history. As they leave, the Doctor and Nyssa feel a temporal distortion–the beginning of a dangerous paradox. Ganatus grabs the injector of GK-50 and threatens to kill the Doctor with it. He reveals that he is not Ganatus anymore; the Emperor, on Skaro, implanted him with its own memories, essentially making him a copy of the Emperor. He forces the Doctor to track down the damaged Dalek, and thus ensure Dalek survival and victory; the Doctor refuses. They are captured by a patrol, and taken to the local Dalek base. Ptolem tells Nyssa of his own secret. He has secretly developed a retrovirus that will wipe out all Daleks. If deployed here and now, in two generations no Daleks will exist. Nyssa begs him not to use it; this moment in history is already damaged and fragile, and any major change to history here can destroy everything. He is adamant, however. Against all odds, the copied Emperor gets the local Daleks to give him a hearing, and tries to warn them about the Doctor’s future interference with the Dalek Invasion (apparently not aware, however, that this is a later version of the Doctor, and exterminating him here will not prevent the presence of the First Doctor in that future year). However, the Doctor tells him that he is the reason for the paradox that may come to pass; by coming back in time, he will ensure the Daleks get the pesticide too early for it to be of any use, and thus he will doom them, setting his own course. If he had not come, the Daleks would have detected the wasp DNA in the damaged Dalek on their own, and extracted it, thus preventing the rise of the mutated creatures. Ptolem tries to use his retrovirus, but the Emperor makes the first move, destroying the pesticide. A wave of time distortion immediately passes through as the paradox is resolved, and suddenly, Ptolem and the Emperor vanish–events in their proper order would never have caused them to come here, after all. The Doctor and Nyssa escape in the TARDIS. Safely back in the vortex, and free of the time corridor, the Doctor explains the outcome to Nyssa. He muses that the universe is safe because the Daleks, for once, followed his advice–and maybe that means there’s hope for them. This is a noteworthy story, largely because it didn’t originate with Big Finish. Rather, the core story comes from an audio drama of the same title, produced by Audio Visuals, which in many ways was the (admittedly unofficial) predecessor to Big Finish Productions. Nicholas Briggs wrote both versions. It has been adapted to some degree to fit in with the main range–notably, Nyssa mentions the events of The Land of the Dead. This story is also considered to be part of the Dalek Empire arc, the third story in that series. With all of that said, you wouldn’t know there was any difference; it’s done in similar fashion to the preceding audios, and fits well with regard to continuity. As with previous Fifth Doctor/Nyssa audios, it must occur between Time-Flight and Arc of Infinity, as Nyssa is the only companion present. There’s a good deal of obfuscation here with regard to the time periods involved, mostly for the sake of suspense; but it has the effect of making it hard to keep track. Three time periods are actually involved: 2158 (mistakenly cited by the Doctor as 2157, but later corrected), nine years before the events of The Dalek Invasion of Earth; 4253, in which the future scenes on Earth take place, and which occurs thirty years after the sudden death of the mutant phase creature on Earth; and an unidentified point in the further future, in which all the Skaro scenes take place. The story is utterly self-contained, in that its events only occur because the Daleks force the Doctor to become involved, and the events resolve themselves–indeed, vanish completely from history–when the Doctor is removed from the equation at the end. Along the way, we get some good throwbacks to The Dalek Invasion of Earth; the Robomen appear again, and we get a mention of the Dalek plan to drill out the Earth’s core and install a hyperdrive. This story occurs largely in America (accompanied by some truly atrocious Midwestern accents), which makes it clear that the invasion really was worldwide, a fact that one could overlook in Dalek Invasion. Nyssa is well-played here as always; I like her character, given that she really doesn’t have any obvious weaknesses. I’ve often said that she’s an intellectual match for the Doctor, and she shows it here, in repairing the TARDIS and researching the pesticide. She’s no match for the Doctor’s pride, unfortunately; he’s more than a little patronising to her, refusing to trust her with certain information, and reacting badly to her repairs on the TARDIS. The Doctor is at his most frustrating here, although I don’t mean that as a complaint; it’s vital to the story, in that he’s intentionally concealing information from those who should not have it. It’s clear here that he feels like events are getting away from him–and indeed, they are; it’s only at the last second that things are set right. Otherwise, characterization is not so great here; Hendryk is a Russian caricature, Ganatus is really nobody at all until the Emperor manifests in him, Ptolem is interesting but nothing new, and everyone else…well, mostly they get killed before they can be anything, really. Truly, the most interesting character here is the Dalek Emperor; we learn that he is the same Emperor that ordered the Dalek Invasion of Earth, two thousand years prior, reinforcing the idea that Daleks are very long-lived. He’s also implied to be the same Emperor seen in The Evil of the Daleks, although I am not sure where that story fits into chronology. Most interestingly of all, he deviates from usual Dalek behavior when he accepts the Doctor’s word and destroys the pesticide; it’s a far cry from the Emperor seen in The Parting of the Ways, which believed itself a god. I could get used to this portrayal; I suppose I’ll have to listen to Dalek Empire to continue his story. Some other references: The Hostile Action Displacement System (HADS) first appeared in The Krotons; strangely, the version seen here is more akin to the Hostile Action Dispersal System seen in NuWho, which cause the TARDIS to disperse into the local area rather than actually relocate. Nyssa refers to Adric’s death, as seen in Earthshock. Strangely, the First Doctor is not directly referenced, but the Doctor mentions him tongue-in-cheek when he comments that he and the Emperor have both had a face-lift. Overall, it’s a great story, and my only dislike is that it was hard to follow the times and locations involved. Of course, that’s by design; but still, it’s annoying at best. It’s a great additioin to the main range, and sets the groundwork for much of the Dalek Empire series. For fans of the Fifth Doctor and Nyssa, it’s a must-listen. Next time: On Thursday we’ll continue our look at the Fiftieth Anniversary series, Destiny of the Doctor; and on Monday, we’ll get a look at the Eighth Doctor’s first Main Range appearance in Storm Warning! See you there. All audio dramas in this series may be purchased from Big Finish Productions; link to this story’s purchase page is below. This and many other selections may also be found on Spotify and Google Play.